World War II, midnight of Sept. 1, 1943: B-Baker, a British-made Short Stirling four-engine aircraft on a bombing mission, flying over German-occupied western Europe. Seven men on board, led by Australian pilot Ken Simpson. An air raid gone awry. A gripping tale of heroism. Four miles to target, B-Baker comes under heavy fire from German forces in the air and from the ground. The pilot flies a loop, gunners return fire and the aimer drops bombs. 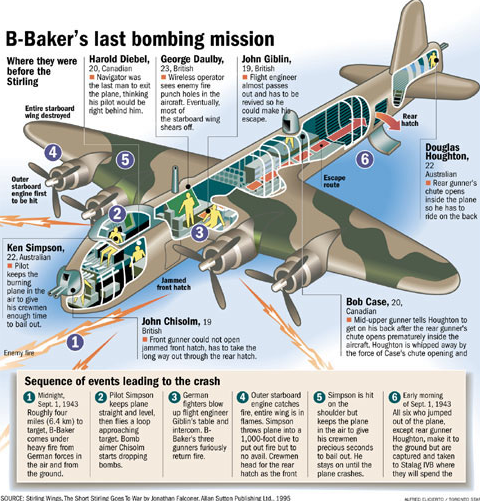 But B-Baker is hit — the starboard engine on fire, the entire wing in flames. Crewmen scramble to bail out. Pilot is wounded but keeps the burning aircraft in the air to buy his men precious seconds to make the jump. He stays on until the plane finally crashed. All the crewmen who parachuted, except one who had to ride on the back of another, made it to the ground in one piece but are captured and taken prisoner. Pilot Ken Simpson, 22, Australian. Kept the burning plane in the air to buy his crew time to bail out. Navigator Harold Diebel, 20, Canadian. The last man out the plane who urged his pilot to follow and actually thought Simpson was right behind him when he jumped out. Flight engineer John Giblin, 19, British. Almost passed out and had to be revived so he could make the escape. Wireless operator George Daulby, 23, British. Saw up close how enemy fire punched holes on the aircraft and sheared the starboard wing off. Front gunner John Chisolm, 19, British. Could not escape through the jammed front hatch, so he had to take the long way out through the rear hatch. Rear gunner Douglas Houghton, 22, Australian. Made a terrible mistake while opening his chute — it opened prematurely inside the plane — so he had to ride off the back of the mid-upper gunner. This mistake caused him his life. Mid-upper gunner Bob Case, 20, Canadian. Yelled to Houghton to get on his back. But once they were out of the plane, the force of the chute opening whipped Houghton away. He did not survive the fall. Graphic by Alfred Elicierto, published in the Toronto Star in 1995.